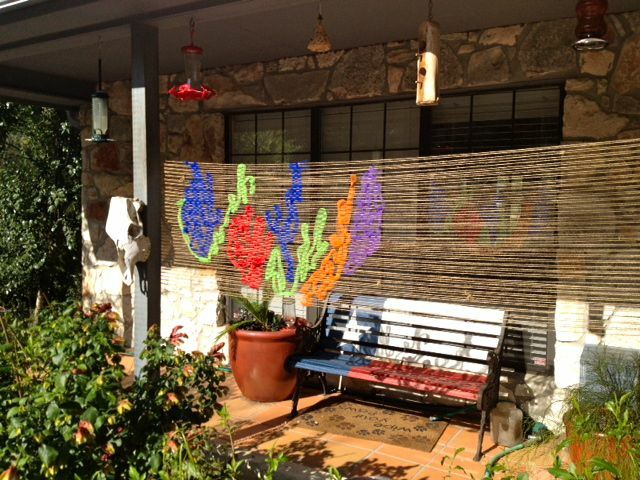 Seems like about two years is the average life span of an outdoor banner made from yarn and fabric in central Texas. These new replacements have been made with colored and clear newspaper sleeves that I've been collecting from friends for a while now. Since newspaper sleeves are recyclable and/or biodegradable now I'm told, it will be interesting to see how long these new banners last. I really love the way they brighten up this corner of the yard. Replacement of the original two outdoor banners finished 8/31. The old ones held up pretty well for two years and they now hang in Austin in a friend's tea house. They were quite faded, but got a touch up with some acrylic paints before hanging. It worked quite well! Started this project two days ago, February 16, 2013. This is progress at Day 3. 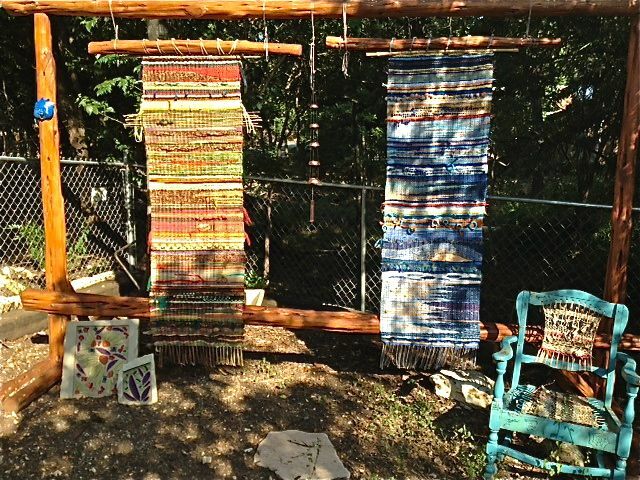 Had some tree trimming done last week, but decided to leave these two trunks in place for another outdoor weaving project. Inspired by a dyed cake of yarn I saw on Ravelry recently. More updates to come in Blog, 03/06/2013. 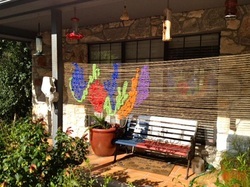 A new outdoor weaving completed in December, 2012, which can be seen from the breakfast area and living room. June 13, 2012. Remember my motto, "If it doesn’t move, weave something on it!"? 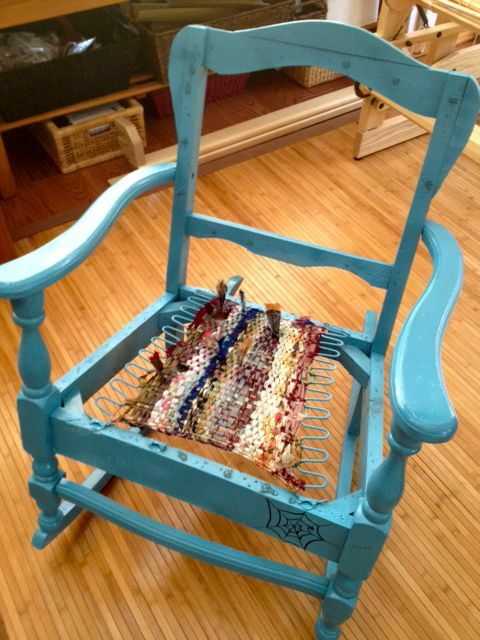 Well, today I wove an old rocking chair a friend gave me, which I had previously spray painted bright turquoise. It was missing all its upholstery and a couple of the springs. 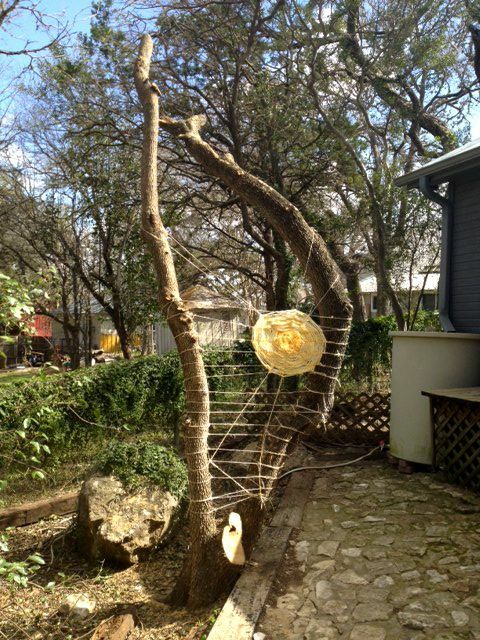 "Yard art," I say. However, it does move. Sometimes. In the wind. :-) So, there are always exceptions to the rules. May 2012. I just couldn't resist ordering these custom street signs for the garden. One is on the garden stock fence, pictured, and one on the second driveway to the property, so it can be seen from the street. 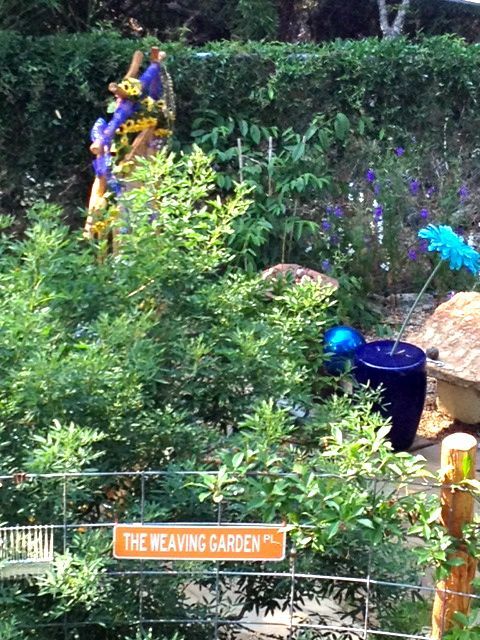 So now it's official -- The weaving Garden Place -- the only one like it in San Marcos, Texas, probably in the entire state of Texas. March 2012. 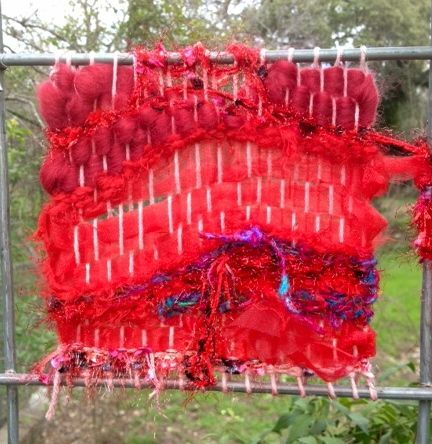 This year's weaving is underway with brightly colored tulle. This looks particularly nice when viewed from the inside as the sun sets in that window. Should be completed in a few days and I will enjoy it the rest of the year! "North" on the Garden Fence. February 26, 2012. "North" on the garden stock fence completed today. 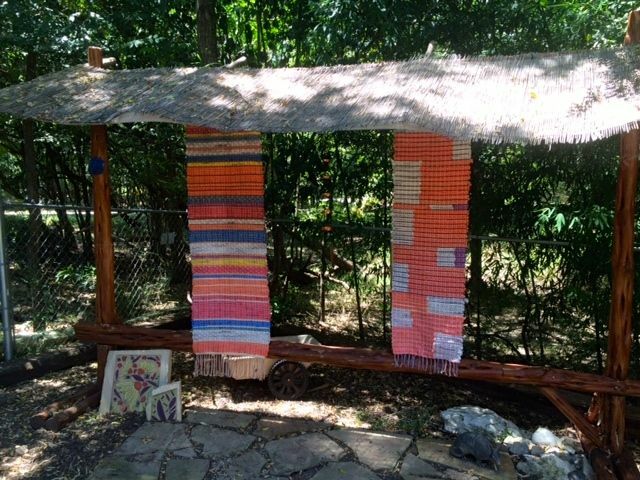 Weaving on the Front Porch. 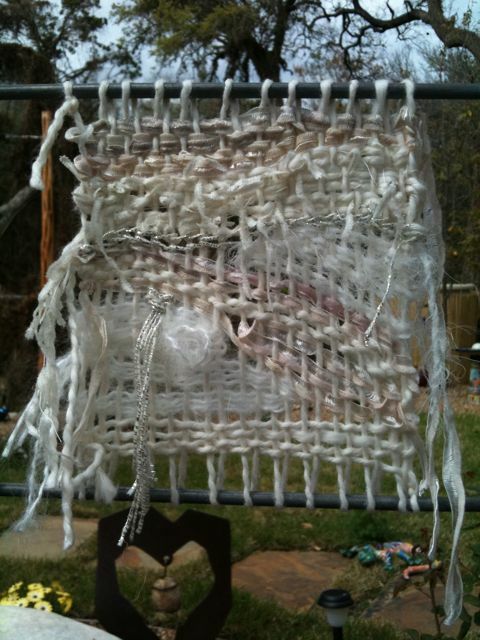 Weaving between the posts on the front porch, spring 2011. 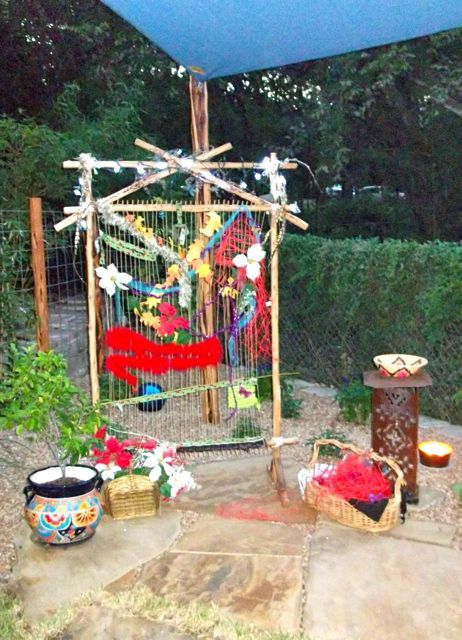 Garden party / loom christening, October, 2011. 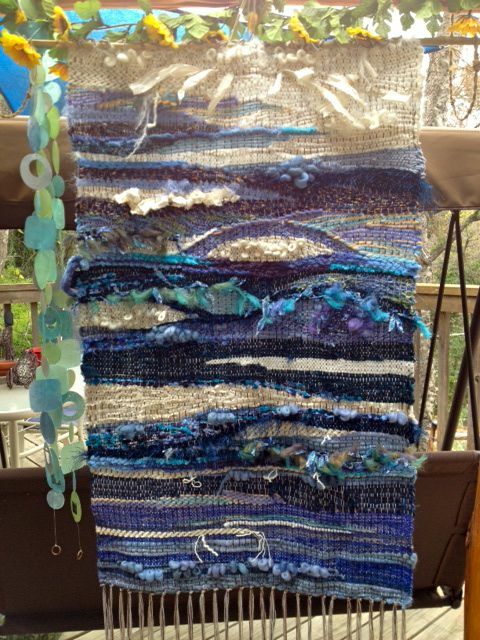 Thank you to all in attendance for this group effort in weaving. Chula, that's Short for Tarantula. 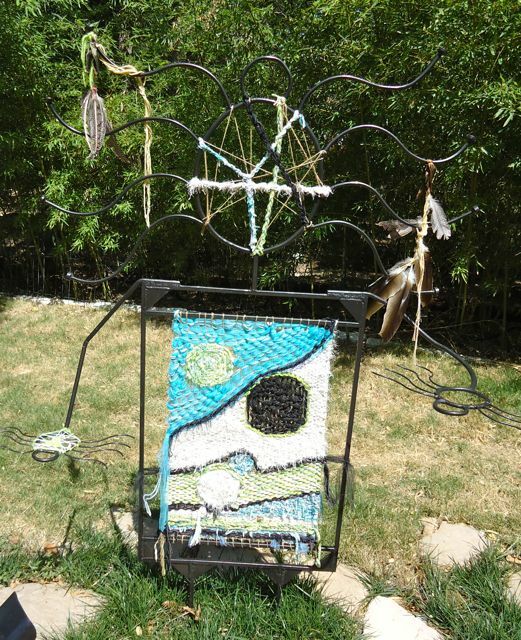 _Wrought iron garden sculpture/loom, fashioned after Spider Woman, who, according to legend, taught the Navajo people how to weave. 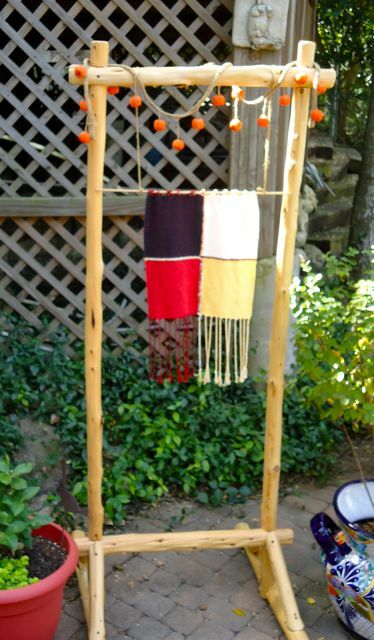 A weaving of the four directions on an outdoor frame on lower deck . If it Doesn't Move, Weave Something on it! "South". 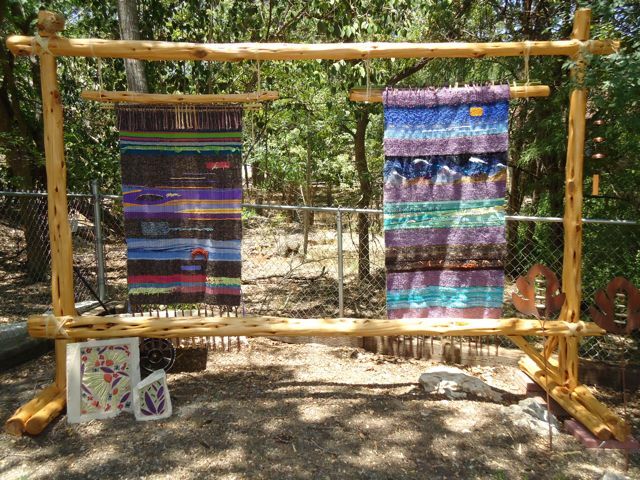 Weaving on the stock fence surrounding the garden, spring 2011. 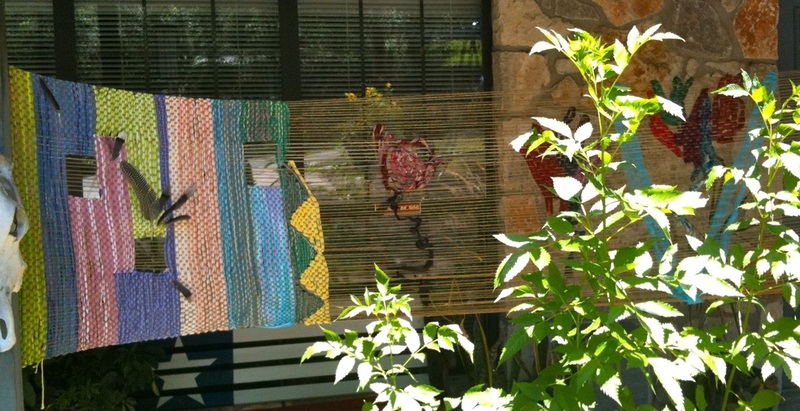 The most recent addition to the outdoor space, fall 2011, as seen from my home studio.